» In the beginning of 2010 I had the idea of building a drivable webcam to monitor my flat when I'm away. The above picture shows the result of my efforts: A three wheeled differentially steered robot that can be controlled via a web interface. 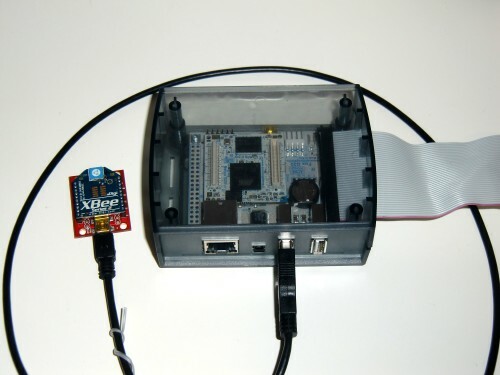 » The web interface is served from a FOX G20 embedded linux board and implemented in Python. 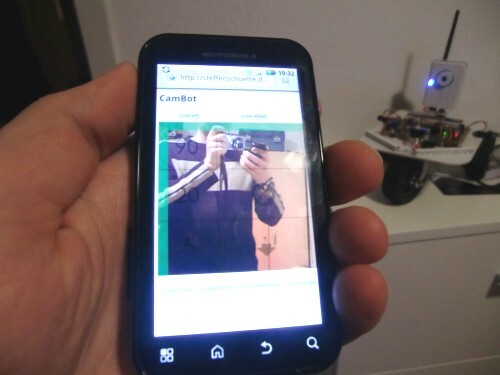 The wireless communication between robot and the web interface is done using two standard XBee ZigBee modules running in transparent RS232 mode. » This picture shows the web interface. 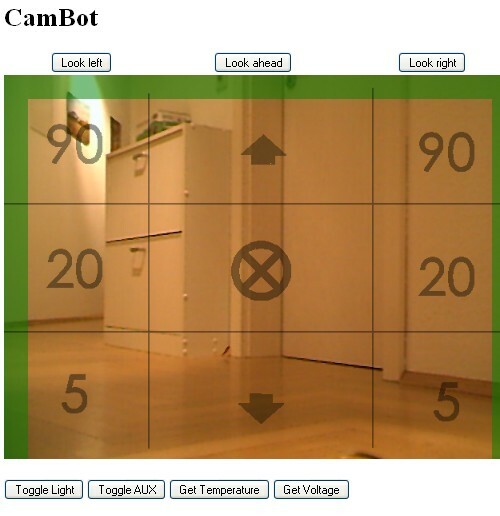 It contains a screenshot of the webcam (connected via WLAN) and allows to control the robot by simply clicking in the different areas of the image. » The above image shows the board that I developed myself in detail. On the very left side the light sensor is shown that activates the cool LED lights when it gets dark (see below). To safe battery power (a 12V/3.4Ah rechargable sealed lead acid battery) the robot has a standby mode. 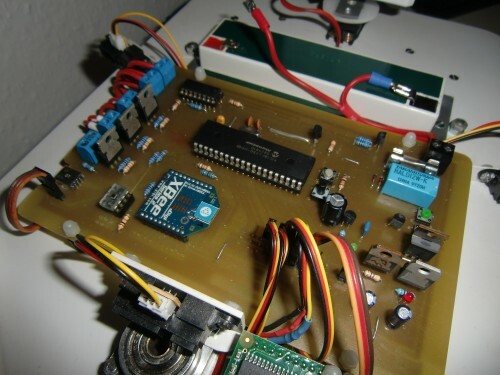 In this mode, only the microcontroller and the XBee module are powered to listen for commands. 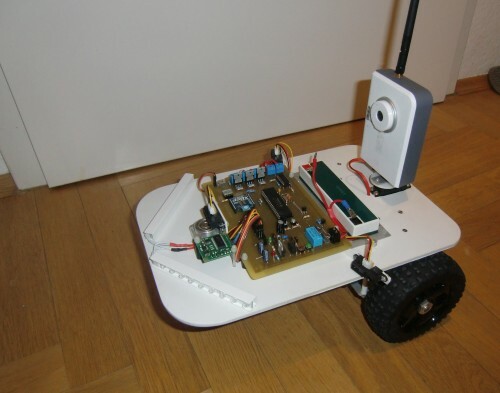 As soon as a command is received, the robot powers up all the other peripherials including the sensors and the webcam. 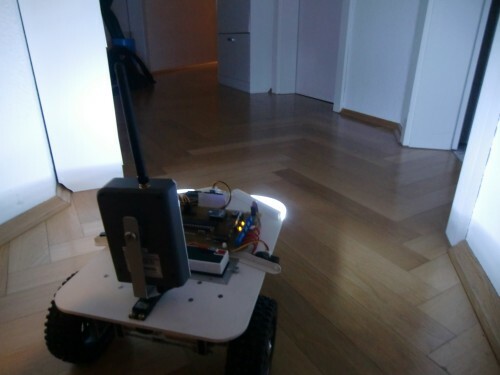 About 50 seconds after the last received command, the robot goes to standby again. This way it can "survive" more than 48 hours without charging. » The LED lights are automatically switched on as soon as it gets dark and are sufficient for an excellent night vision. 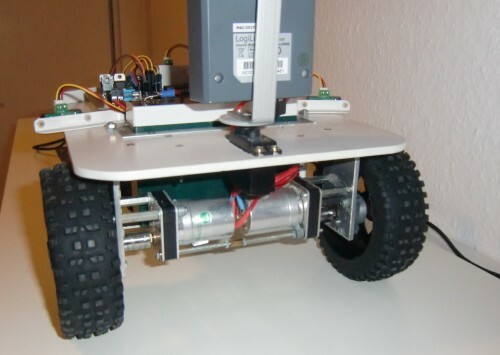 » The robot is powered using two geared motors that I got off the shelf (I forgot where I bought them).